Irreverent Engineer | Will Robertson on his ‘real’ work. wspr81 at gmail dot com. Adelaide, Australia. Will Robertson on his ‘real’ work. wspr81 at gmail dot com. Adelaide, Australia. 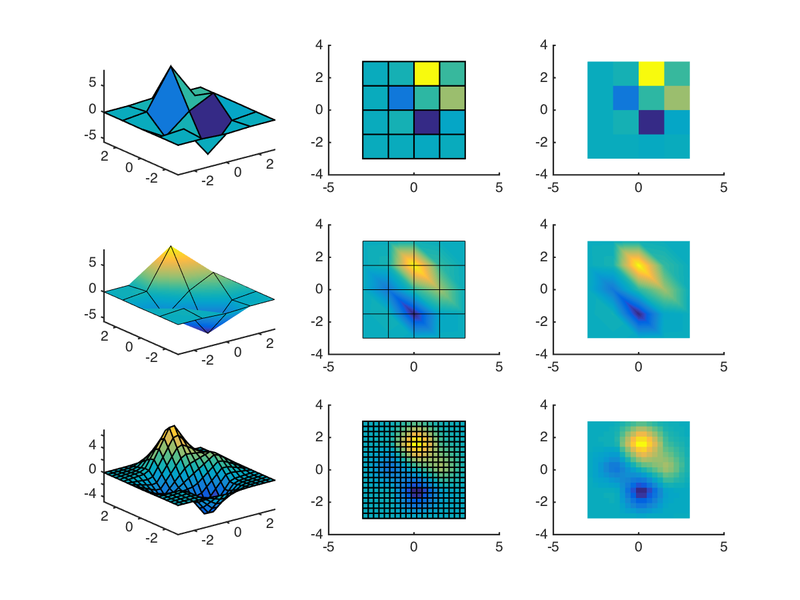 Matlab has a number of methods for interpolating data, both for data that is sampled on a regular grid and for data that is “scattered”, or randomly distributed. 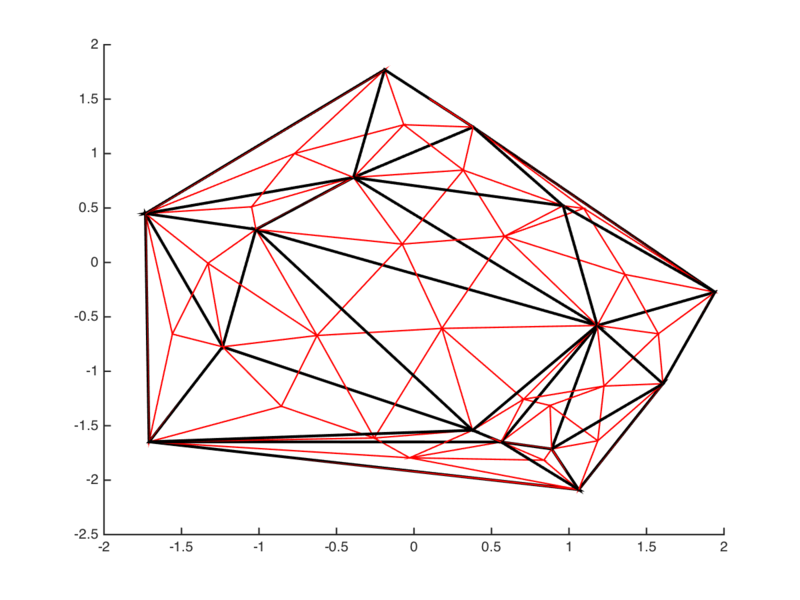 The variables x and y are 10×10 matrices defined by (the equivalent of) [x,y]=meshgrid(linspace(-3,3,10)), and z is the value at each point in (x,y) space. If you have sampled data with non-uniform spacing, however, it’s not as obvious how to plot that data. In this case your data would be organised with x, y, and z as column vectors with each measurement per row. The structure of the surf command simply doesn’t handle data in this form, since the data isn’t organised in a way that allows adjacent points to be connected. Seems slightly redundant, but easy enough. 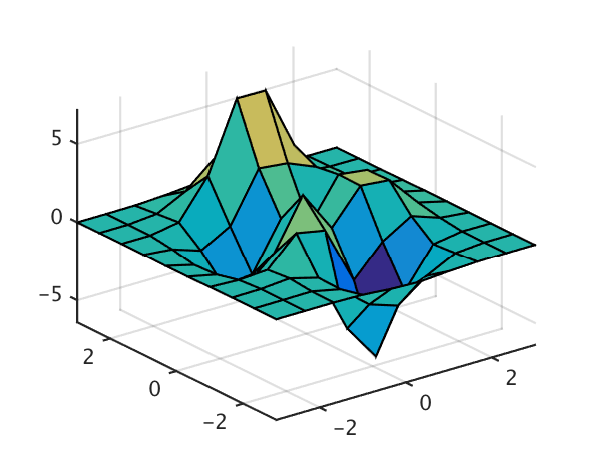 Note that without the interpolated shading, the plot is basically unusable. But even with interpolated shading, there’s significant distortion along certain diagonals. I’ve left out the edge lines in the bottom-right graph to emphasise this. 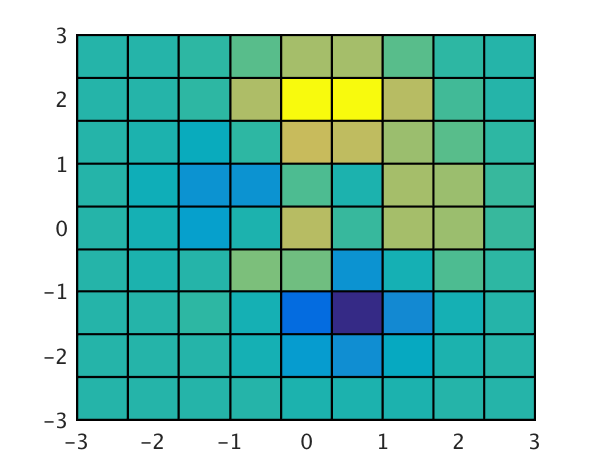 If we resampled this function over a regular grid using scatteredInterpolant, we’d end up with points outside the original region, which might not always be appropriate. We could then delete the outsiders, but that would require additional processing. Wouldn’t it be nice to simply resample within the original? Interpolation will never solve the problem of under-sampling if there’s information missing, but it definitely helps to draw more pleasing figures. with a few additional options. Check out the example file for more, er, examples. My real work in magnetics involves evaluating sometimes complex integrals that often result in solutions that include the elliptic integrals. These are a funny set of functions that I’ve discussed before. 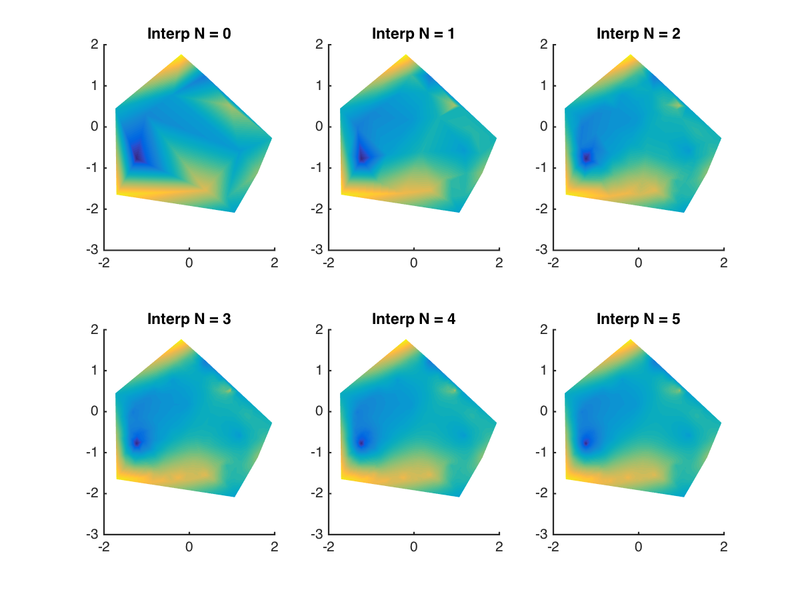 Matlab has historically only included the bare minimum here: in-built function to calculate the first and second complete elliptic integrals. Hence Igor Moiseev’s valuable work in this area (now moved to Github). 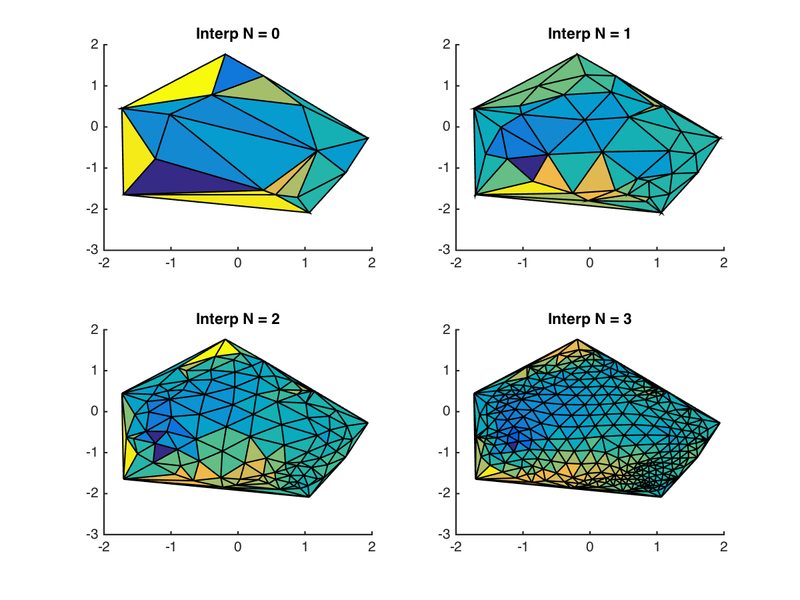 Those with a variety of Matlab toolboxes, however, will usually run into the newish functions provided by the symbolic toolbox ellipticF, ellipticE, and friends. (Quite an impressive collection, actually.) However, if you actually wish to use these functions for something computationally intensive, such as numerical integration, it’s a bad idea to use them. Why? Elapsed time is 0.020991 seconds. Elapsed time is 0.000705 seconds. So the symbolic toolbox is fine if you just need to evaluate a value or two. But for anything iterative — and this holds for algorithms in general, not just for my own example of numerically integrating elliptic integral functions — you’ll want to avoid the overhead of switching to the symbolic toolbox mid-calculation. This is I’m sure old news to Excel gurus out there (of which I’m reluctantly, seemingly, turning into). 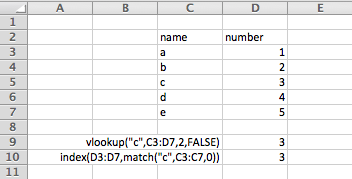 I started having a little more appreciation for Excel when I began using vlookup more seriously; this allows a semi-structured way of dealing with linked data in Excel. E.g., when a list of grades has a different set of students than a class list, you can still sensibly lookup values without manually copy/pasting information from one to the other. I hope this is fairly obvious; we have an extremely basic lookup-style functionality (hence the name) where the function looks up "c" in the first column and outputs the corresponding entry in row 2. You’d obviously usually use a reference to another cell rather than hard-code the "c" entry in there. So this is great, but comes with some problems. First of all, vlookup of course has the incredibly frustrating default behaviour of not exactly matching entries; in my own experience, things never work out unless you write it in the form vlookup(•,•,•,FALSE) — and if I’m rusty I never remember whether I should be writing true or false as the argument in there. So that’s one reason vlookup is dumb. Unlike what happens in a lot of other Excel cases, inserting the new column hasn’t updated the vlookup equation (not saying it should, though). And our lookup now obviously returns different data. This can bite you pretty bad unless you have stringent error checking somewhere along the line. Translating that formula into prose produces something like this: “index into column D the row that matches “c” in column C”. Note again Excel’s insistence that you need a dumb suffix to tell match to do its thing properly; don’t forget the match(•,•,0). 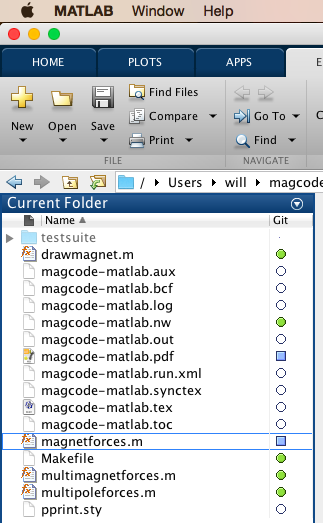 As soon as we inserted the extra column, the match function automatically updated and our formula is still correct. You can argue more tenuous advantages about index+match (e.g., that vlookup can’t have a negative column index), but automatic updating is the killer. I’ve recently been interested human body modelling in biomechanics. One of the honours projects I’m supervising has a goal of producing a mock lumbar spine, which lead us to a Thingiverse example of exactly that (our will have additional features for attaching fake ligaments and disks, however). 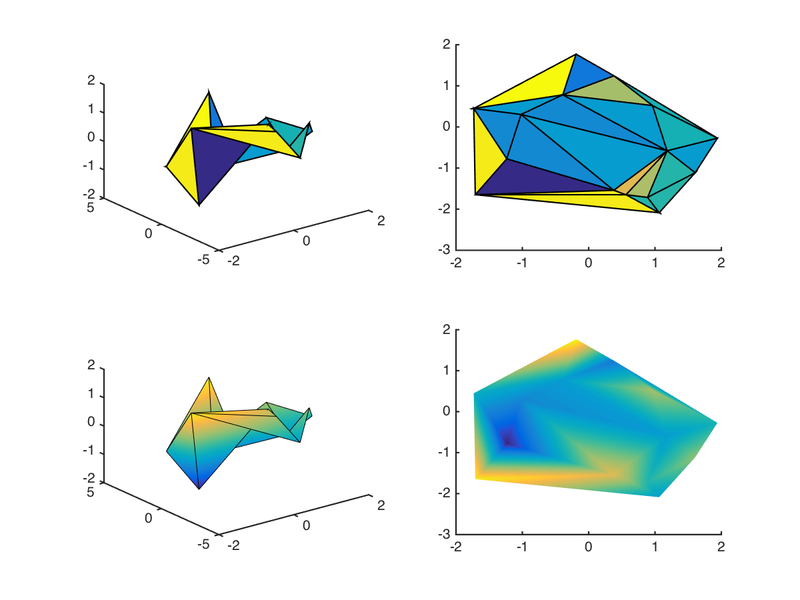 Using the low-resolution models, I’ve imported the bones of the model into Matlab using Dirk-Jan Kroon’s Wavefront OBJ toolbox; the results are shown below. I’ll tidy up the code and make it public as soon as I can; a few things on my plate before I can do this, however. 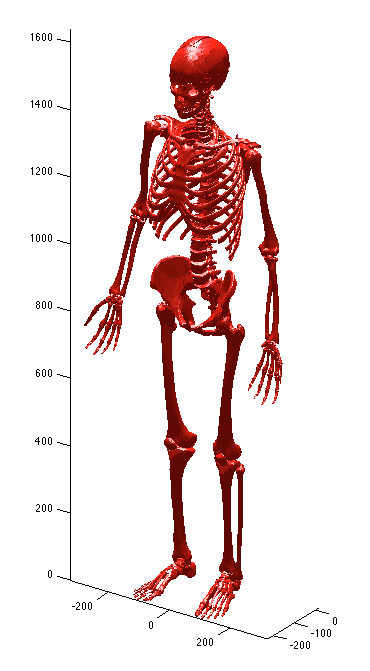 Long term, I’d like to make the skeleton move and use the anthropometric data to annotate tendon attachments and insertions on the skeleton to start producing an anatomically correct dynamic simulation of human motion. I know this is being done by OpenSim already and it would be counterproductive to re-invent the wheel, but there is still some scope for some orthogonal research in this area.